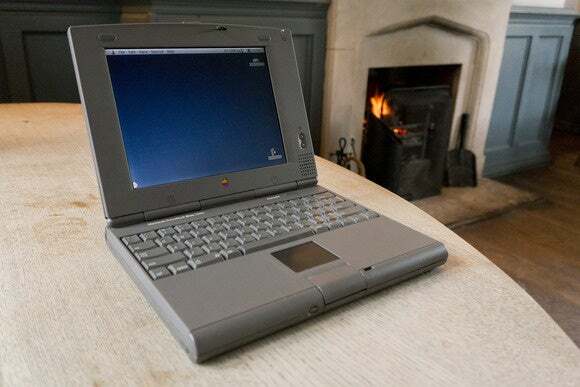 With all the excitement last week over the new MacBook, it seems only right and proper that today Think Retro turns its attention to Apple’s original superlight laptop, the PowerBook Duo. The Duo is easily in my top five favorite Apple computers of all time because the whole concept is just so intensely pleasing. Let me explain. PowerBook Duos were small, light, capable laptop computers. Actually, I need to caveat all of that! 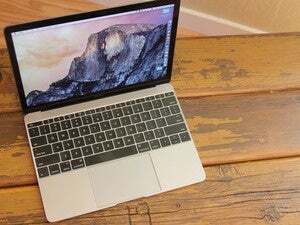 It was still nearly an inch and a half thick, and at 4.2 pounds, it nevertheless weighed more than two of the new MacBooks. And even though the last model got one of the spangly new PowerPC processors, they were definitely both slow even by the standards of the day and they didn’t even have a floppy drive far less a CD-ROM or Ethernet. But the real joy and genius of the PowerBook Duo is that you could either attach one to a small portable dock or, best of all, slide it into a big desktop dock, and by adding ports, extra storage and features, it transformed into a highly usable desktop system. The daddy of these docking systems was the Duo Dock, a big case the size of a traditional desktop computer. 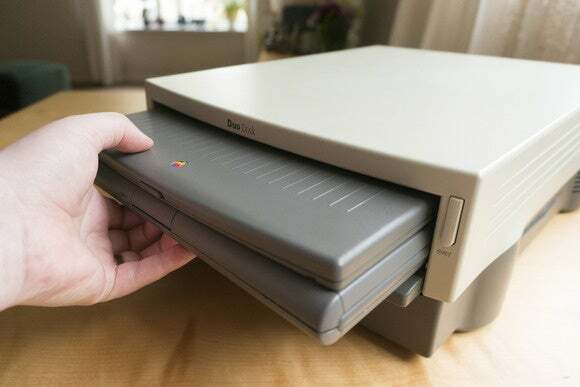 The idea was that you’d have a monitor on top of it, and a keyboard, mouse, printer and network permanently attached to it, all just sitting waiting for you to slide the PowerBook Duo in. Once you did, your Duo was immediately connected not just to all this stuff but also to the Dock’s internal floppy drive, NuBus expansion slots, and a second hard disk, as well as optional features that gave it more processing grunt: a Floating Point Unit, level 2 cache and more VRAM to drive bigger monitors with more colors. The Duo Dock would also, of course, charge the Duo’s internal battery. When you were done, you just ejected the PowerBook Duo—and I do mean “ejected”. 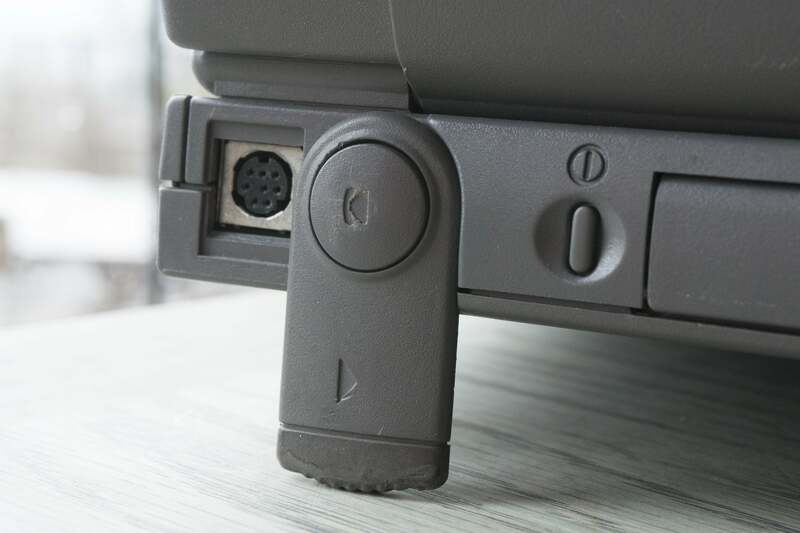 Pressing the eject button on the front would prompt you to save work, shut down the PowerBook, then physically push it out of the front of the Duo Dock just as if the whole laptop was an oversized floppy disk. Indeed, gloriously, just as there were slots next to floppy drives into which you could insert a straightened paperclip to force-eject a recalcitrant disk, so too was there a manual eject button for the laptop itself on the Duo Dock! In fact, actually you shouldn’t really think of it as a laptop at all. What the Duo system really was was a desktop machine that gave you the option of taking the essential bits with you when you got up from your desk, and I think there’s something very appealing about that idea even today. You could argue, of course, that what you were taking with you with the PowerBook Duo was a compromise necessitated by the limitations of the technology of the day, and that today our portable computers don’t need to have the same compromises thanks to advances both in wireless technology and in the power and power demands of modern CPUs. If Apple reinvented the PowerBook Duo for the 21st century, you could expect to see my kidneys on eBay. I often think of that line when I’m waxing lyrical about old tech. As a result, presumably, of this stuff being the technology I first really saw, understood and interacted with, it usually seems that these old ways of doing things, and that these old computers’ bulky, swooping forms are just somehow correct and inevitable. 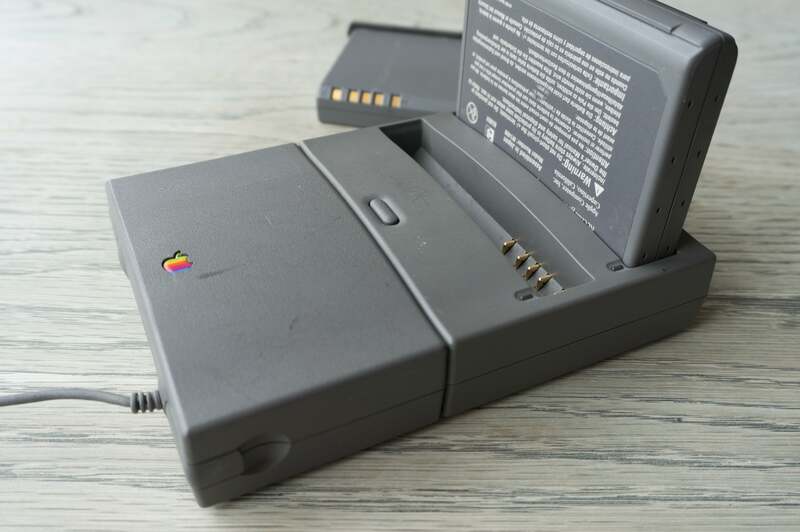 Even though a MacBook has vastly more power than the PowerBook Duo, and doesn’t need the crutch of off-board coprocessors and so on, I will forever miss the dorky excitement of clunking an entire laptop into a desktop case, and ejecting it like a VHS cassette when I’m done. It’s what computers are supposed to be like! I have a few Duos, and let me tell you that while I love them to bits, one thing you notice is that Apple’s fit and finish has, shall we say, improved markedly since their introduction in the early ’90s. 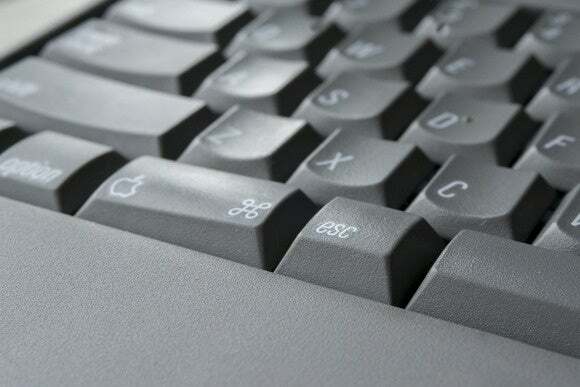 The whole keyboard plate deforms when you type on its spongy little keys, the screen has a laughable amount of wobble, and everywhere on the bodywork are uneven gaps and lines that don’t quite meet up. And while I’m about it, what the hell was Apple thinking putting the Escape key right under my thumb next to the space bar? There are, though, still some lovely little touches. Take, for example, how the swing-down feet at the back double as covers for the ports. And you also have to love the power brick. 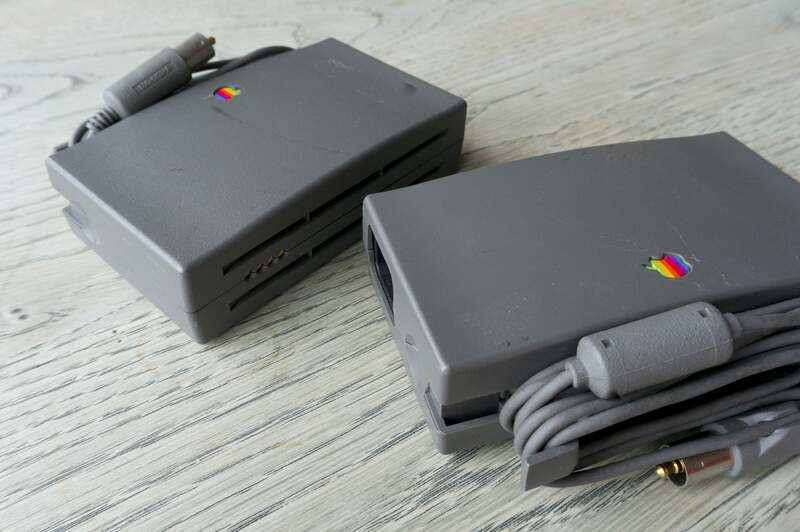 Not only did it have the flick-out arms for cable management that Apple still uses to this day, but there were also some metal contacts on one side of it. These were so you could click this PowerBook Duo Battery Recharger into place, which had two slots for charging up the removable battery packs that powered the laptop. The batteries themselves came with cases, so you could charge a few of them up on this and then safely carry them about, ready to pop into the Duo when another ran out; I bet there are more than a few folk who wish they had that option today. Yes, I adore the Duo. It really is, even by today’s standards, a compact little machine, and while it weighs twice what the new MacBook does, it’s only three-quarters the weight of my 2008 MacBook Pro. And if Apple reinvented it for the 21st century—with an external, Thunderbolt-connected GPU, and “Fusion Drive 2” which pairs an external, cloud-aware hard disk with the “new Duo’s” PCIe SSD, all wrapped up in a 30-inch Retina screen, not unlike a Thunderbolt Display, into which you slotted the Duo—you could expect to see my kidneys on eBay faster than you could say “shut up and take my money”.